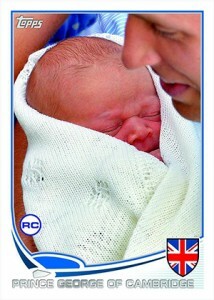 Not even two weeks after he entered the world, Prince George of Cambridge is already slated to get his "rookie card." Topps announced on Twitter that the future heir to the throne will have a baseball card in 2013 Topps Update Series. The card pictures the young baby wrapped with his head barely poking out of a white blanket. His father, Prince William, can also be seen. The design sticks with the 2013 Topps Baseball design, although the spot for the team logo has been replaced be an icon with the Union Jack. There's even a "rookie card" designation. The Prince George baseball card will not be part of the main 2013 Topps Update Series base set. Rather, it will be a short print -- an insert that's tougher to find than regular cards. There is no shortage of Royal Family collectibles. A quick look at eBay shows everything from photos to toys to scary cross-stitched cushions already listed featuring the baby. When parents Prince William and Kate Middleton got married, Topps produced a set for the royal couple's wedding in 2011 that was sold on QVC. They also made a handful of other commemorative cards for other sports card sets. Then there are all the Charles and Diana cup and saucer sets that line millions of fine china cabinets around the world. 2013 Topps Update Series Baseball is scheduled for release in October. HRH Prince George of Cambridge Christening Mug - Aynsley - Ltd. Ed. Ridiculous, yet another gimmick card by Topps. Except this one goes a bit too far.